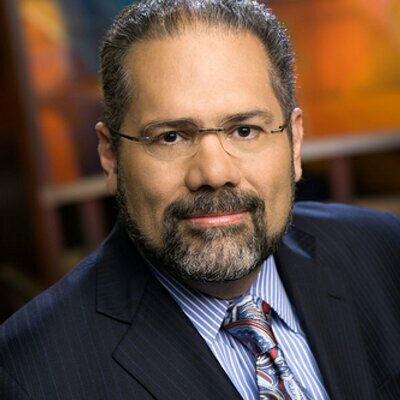 Ray Suarez is a veteran journalist and author with an extensive career in radio and television, most recently as the host of Al Jazeera America’s daily program, Inside Story. His books include, The Holy Vote: The Politics of Faith in America. Prior to joining Al Jazeera, Suarez served as chief national correspondent of PBS’ NewsHour and lead correspondent for the program’s global health coverage, reporting on some of the world’s most threatening health crises from Africa, Latin America and Asia. He was host of National Public Radio’s Talk of the Nation for six years, host of the monthly foreign-affairs radio program America Abroad for Public Radio International, and co-host of the nationally broadcast weekly political program Need to Know for PBS. From 2008 to 2011, he anchored the weekly Latino politics show “Destination Casa Blanca” for HITN TV. Suarez is the author of The Holy Vote: The Politics of Faith in America. He is also the author of the critically acclaimed Latino Americans, the companion book to the PBS documentary series of the same name, and The Old Neighborhood: What We Lost in the Great Suburban Migration. In 2010 he was inducted into the National Association of Hispanic Journalists Hall of Fame. He is a co-recipient of two Alfred I. duPont–Columbia Awards for NPR’s on-site coverage of the first multiracial elections in South Africa and of the first 100 days of the 104th Congress. His other honors include the Ruben Salazar Award from the National Council of La Raza, the Distinguished Policy Leadership Award from UCLA's School of Public Policy and the Studs Terkel Award from the Community Media Workshop. Suarez earned a B.A. in African history from New York University and an M.A. in the social sciences from the University of Chicago and has been awarded more than a dozen honorary degrees. A native of Brooklyn, Suarez lives in Washington, D.C.